This article appeared in The Guardian on 1985 January 5 under the heading A Flashlight in the Forest (below). It is reproduced here, slightly edited to clarify and update various points, and with the addition of several illustrations. IN December 1980, something remarkable was said to have occurred outside the US Air Force base at Woodbridge, near Ipswich in eastern England. News of the event leaked out slowly, finally hitting the headlines in October 1983: “UFO lands in Suffolk – and that’s official”, screamed the front page of the News of the World, a popular UK tabloid. The story was sensational. 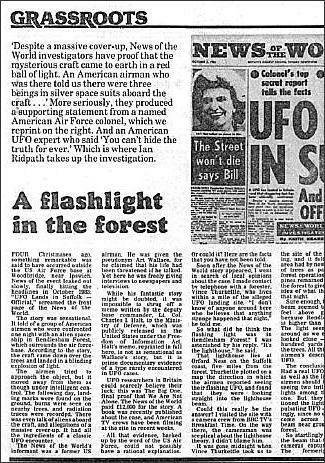 It told of a group of American airmen who were confronted one night with an alien spaceship in Rendlesham Forest, which surrounds the air force base. According to the story, the craft came down over the trees and landed in a blinding explosion of light. The airmen tried to approach the object, but it moved away from them as though under intelligent control. The following day, landing marks were found on the ground, burns were seen on nearby trees, and radiation traces were recorded. There was even talk of aliens aboard the craft, and allegations of a massive cover-up. It had all the ingredients of a classic UFO encounter. The News of the World’s informant was a former US airman. He was given the pseudonym Art Wallace, for he claimed that his life had been threatened if he talked [note: his real name is Larry Warren, as everyone now knows]. Yet here he was freely giving interviews to newspapers and television. While his fantastic story might be doubted, it was impossible to shrug off a memo written by the deputy base commander, Lt. Col. Charles I. Halt, to the Ministry of Defence, which was publicly released in the United States under the Freedom of Information Act. Halt’s memo, reprinted in full here, is not as sensational as Wallace’s story, but it is prime documentary evidence of a type rarely encountered in UFO cases. UFO researchers in Britain could scarcely believe their luck: this was The Big One, final proof that We Are Not Alone. The News of the World paid £12,000 for the story. A subsequent book about the case, Sky Crash by Brenda Butler, Jenny Randles, and Dot Street, described it as “unique in the annals of UFO history...the world’s first officially observed, and officially confirmed, UFO landing and contact”. Cable News Network made a documentary about the case [now viewable on YouTube]. All that evidence, backed up by the word of the US Air Force, could not possibly have a rational explanation. Or could it? I have my own detective story about the Rendlesham Forest UFO. Soon after the News of the World story appeared, I went in search of local opinions about the case. I made contact by telephone with a forester, Vince Thurkettle, who lives within a mile of the alleged UFO landing site [he now lives in Norfolk]. Immediately I was brought down to Earth. “I don’t know of anyone around here who believes that anything strange happened that night,” he told me. So what did he think the flashing light was in Rendlesham Forest? I was astonished by his reply. “It’s the lighthouse,” he said. That lighthouse lies at Orford Ness on the Suffolk coast, five miles from the forest. Thurkettle plotted on a map the direction in which the airmen reported seeing their flashing UFO, and found that they were looking straight into the lighthouse beam. Could this really be the answer? I visited the site with a camera crew from BBC TV’s Breakfast Time programme. On the way there, the cameraman was sceptical about the lighthouse theory. I didn’t blame him. It was past midnight when Vince Thurkettle took us to the site of the alleged landing, and it felt spooky. The area had by now been cleared of trees as part of normal forest operations, but enough pines remained at the edge of the forest to give us a realistic idea of what the airmen saw that night [see photo below]. 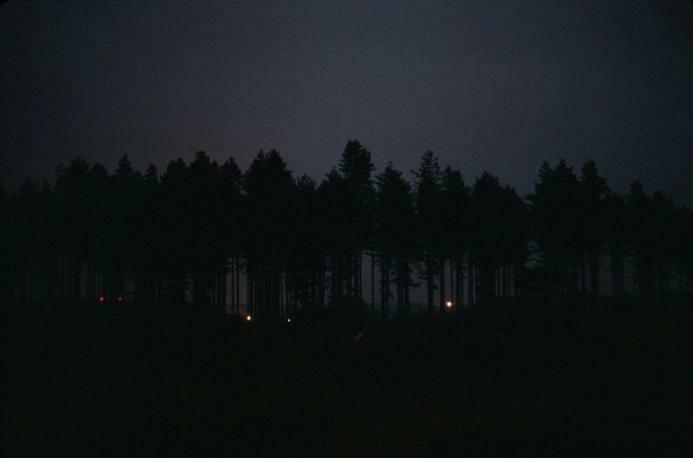 Night light: I took this photograph on my second visit to the forest, in 1983 November. The Orford Ness lighthouse is the bright yellow-white light at right of centre, seen between trees that were still standing at the edge of the forest, although the area in which I was standing had by then been cleared. Two other whitish lights left of centre were on a building or buildings in the valley, which I did not identify at the time. At far left are two red lights on tall aerials on Orford Ness itself, which are easier to see on a larger version of the above photograph. On a separate page you can see other photographs of the area taken during my visit in 1983 November, including a daytime view of these same trees. Sure enough, the lighthouse beam seemed to hover a few feet above ground level, because Rendlesham Forest is higher than the coastline. The light seemed to move around as we moved. And it looked close – only a few hundred yards away among the trees. All this matched the airmen’s description of the UFO. 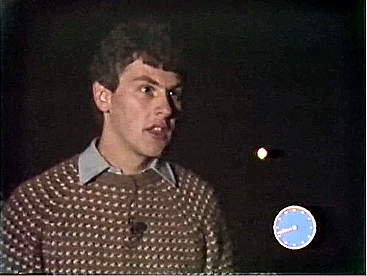 Flashes: Vince Thurkettle interviewed by me in Rendlesham Forest for BBC TV in October 1983. The lighthouse beam is seen over his shoulder, above left of the blue on-screen clock. Click on the picture to go to a separate page from which you can download a movie file showing the lighthouse flashing. The conclusion was clear. Had a real UFO been present as well as the lighthouse, the airmen should have reported seeing two brilliant flashing lights among the trees, not one. But they never mentioned the lighthouse, only a pulsating UFO – not surprisingly, since no one expects to come across a lighthouse beam near ground level in a forest. So startlingly brilliant was the beam that the television cameras captured it easily [see still frame at left]. The formerly sceptical cameraman was convinced. My report was shown the following morning on Breakfast Time, much to the dismay of UFO spotters and the News of the World reporter [you can see the complete news item here]. The lighthouse theory soon had its supporters and its detractors. But there were still too many open questions for the case to be considered solved. For instance, what about those landing marks? 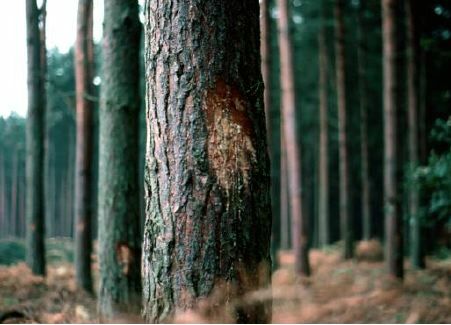 Some weeks later [in 1983 November] I returned to Rendlesham Forest in search of answers. The landing marks had long since been destroyed when the trees were felled, but I now knew an eyewitness who had seen them: Vince Thurkettle. He recalled for me his disappointment with what he saw. The three depressions were irregular in shape and did not even form a symmetrical triangle. He recognized them as rabbit diggings, several months old and covered with a layer of fallen pine needles. They lay in an area surrounded by 75ft-tall pine trees planted 10ft to 15ft apart – scarcely the place to land a 20ft-wide spacecraft. [Note: this is one of the various estimates of size that have been made. Witness Jim Penniston has said the object was “the size of a tank” although Halt’s memo described it as 2–3 metres across]. 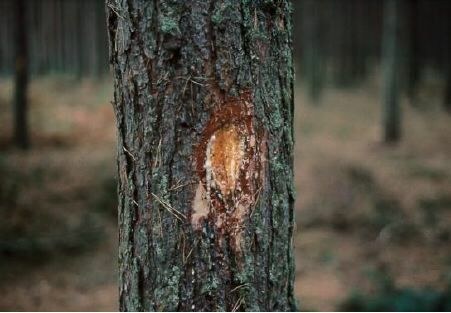 The “burn marks” on the trees were axe cuts in the bark, made by the foresters themselves as a sign that the trees were ready to be felled. I saw numerous examples in which the pine resin, bubbling into the cut, gives the impression of a burn [see photos below]. Slash and burn: Cuts made by foresters on pine trees of Rendlesham Forest give the impression of burn marks. Photos taken in 1983 November. Additional information came from other eyewitnesses – the local police, called to the scene by the Woodbridge air base. The police officers who visited the site reported that they could see no UFO, only the Orford Ness lighthouse. Like Vince Thurkettle, they attributed the landing marks to animals. The case for a landed spacecraft was looking very shaky indeed.